I saw these breakfast cookies on Pinterest, and knew I wanted to make them for our upcoming sisters weekend. Every year one of the sisters hosts a sisters weekend. Its the best time. This year it will be hosted by Lori. She lives on Long Island so it will be 2 trains to get to her, but so worth it to spend time with my beautiful sisters. I have decided to make these breakfast cookies as a little fall gift for each of them. They all like to work out so this will be a perfect breakfast treat for them. I packaged them in small cellophane bags, and attached the recipe to the package. I hope you enjoy these delicious breakfast cookies as much as I did. Last night I made a new recipe. This took a bit of time, but so worth it. Like any new recipe you find yourself constantly going back and reading the directions. Im thinking after a few times making this recipe I might not have to look at the directions anymore. You can use any kind of pasta, but I like the Rotini. It keep all the flavor from the sauce in those little spirals. Click~ HERE ~ for the entire recipe. Enjoy your day especially if you live in the North East, it’s going to be beautiful for the next few days. Recently I came across a great idea from one of my blog friends, and I thought I should share this. She has the directions you can follow to make this yourself. I’m so happy they fit so nicely on the window sill. The only thing I did different was to add these little hearts to the top of the close pin. I put the tag right on the close pin. I found it easier to use a little bit of glue and stick it right onto the close pin. You can purchase the galvanized metal planter set here. And the Printable Herb Garden Markers here. I love that I can just go to the window sill and get my mint now – and the basil and parsley as well. Thank you Anne for this great idea. I found this amazing recipe on Pinterest the other day. I can’t believe I found this now, because I was looking for something simple you could make the night before over the holidays. This will be on our Christmas holiday table next year for sure. Heat oven to 375 degrees. Generously spray inside of an 8″x 8″ square baking dish with cooking spray & place on a baking sheet. In a large bowl, mix together the oats, sugar, baking powder, orange zest, cinnamon, salt, half the pecans, & half the strawberries. Add to prepared baking dish. Arrange the remaining strawberries, pecans on top of the oats. Then, scatter the banana slices. In another large bowl, whisk together the milk, egg, butter and vanilla extract. Then, pour over oats and fruit. Gently shimmy and shake the baking dish to help the milk mixture go throughout the oats. Bake oatmeal for 35-40 minutes or until the top is golden brown and the milk mixture has set. Enjoy it’s delicious ~ Had this for breakfast this morning. Add salt ~ pepper ~ olive oil ~ parsley ~ onion powder ~ and ~ basil to the vegetables. Close the plastic bag and shake until it is evenly distributed ~ refrigerate for one hour. Put vegetables onto cookie sheet with an edge and put into 350 preheated oven for one hour. After 30 minutes flip vegetables around and cook for an additional 30 minutes. Hoping you are having a peaceful day. In large bowl, combine oats and pecans; mix well. 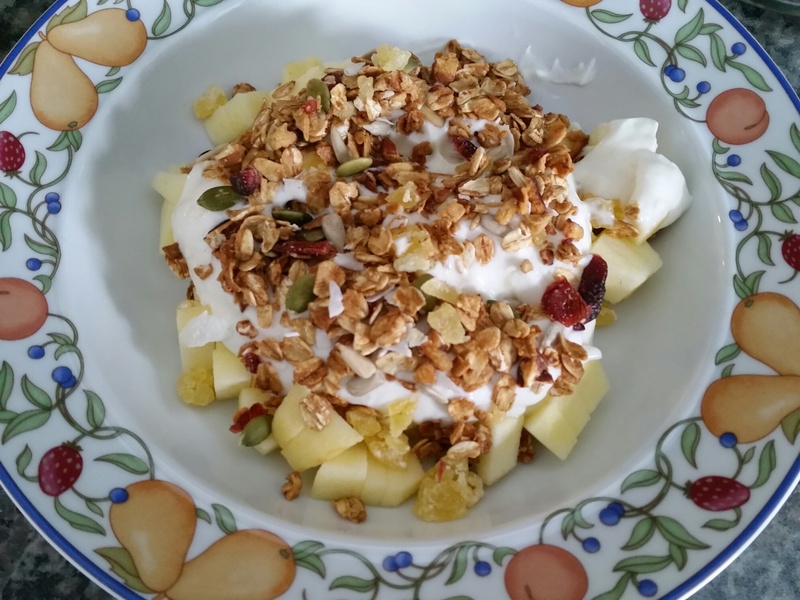 *I use on top of yogurt and only use 1/4 cup – its plenty. I have to say it came out amazing ~ I did not taste it yet, but if it tastes as good as it smells, I’m thinking it will be pretty good. Put butter, sugar, vegetable oil, & water into a Pyrex dish and microwave for 90 seconds. Mix all wet ingredients together, add flour right away and mix everything together. 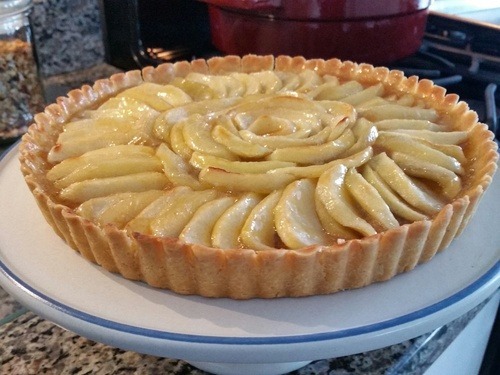 It will be warm, but this is good – you will be able to form the dough in bottom and sides of tart pan. Put into fridge for 30 minutes. Take shell out of fridge and let stand till it becomes room temp. around 15 mins. On stove top melt butter, sugar & cinnamon ~ pour apples into butter mixture. 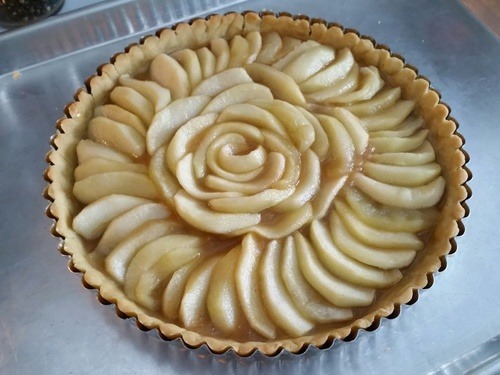 Stir together in apricot jam ~ then use pastry brush and coat the bottom of the pie shell with the mixture. Keep the rest for later. Let stand until room temp around 30 minutes. Brush melted butter 1T on top of apples and top of pie crust. This will melt the sugar and the apples will be a bit brown on the edges. 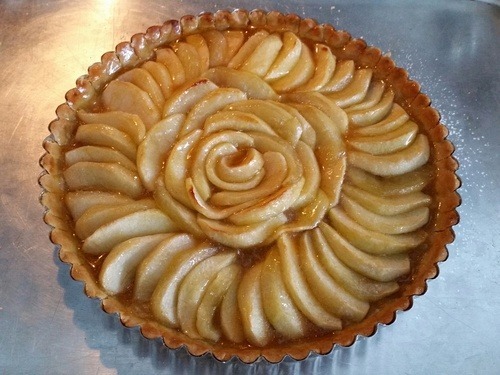 Then use the remaining apricot jam mixture and brush all over the top of the tart including the crust. Can be made in morning and served later that night. You can warm up before serving. baby pearl pasta (about a cup) you can add less or more if you like. I like using a cup because the pasta will absorb the liquid and then it looks like a stew instead of a soup. Put small about of olive oil in bottom of pot (the one you will be using for the soup) put leeks,celery & carrots and cook for about 5 ~ 7 mins. Add spinach and small pearl pasta simmer for another 30 mins. 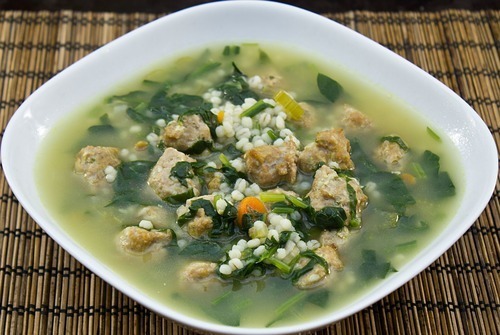 Place in bowls and add the pecorino romano cheese….. In large skillet add olive oil saute 1/2 a leek, about 5/7 mins. Cut tomatoes and put into saute leeks – put cover on pan and simmer for 10 mins. Add broccoli (or whatever vegetable you like) – simmer covered for 5/6 mins. You will see that you need a little more liquid for the vegetables – I use 1/4 – 1/2 cup of white wine, but you can also use chicken stock. 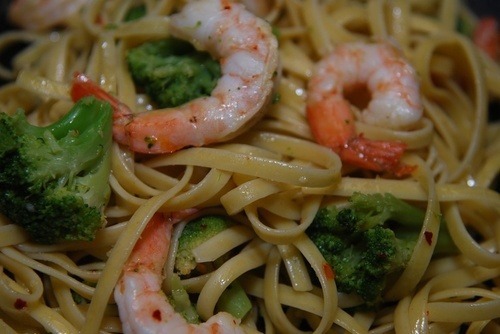 When pasta is almost finished – put shrimp into broccoli & tomato mix. Add cover again and cook for 5 mins or until shrimp is cooked. Add vegetable & shrimp mixture to pasta and top with Pecorino Romano cheese. Chop basil and sprinkle on top of pasta.